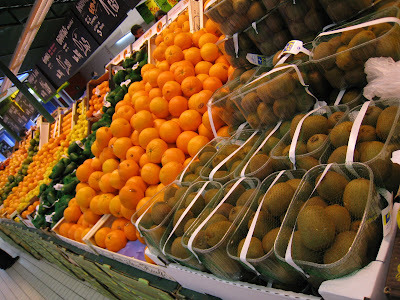 When I do my grocery shopping, the first area I visit is the fruit and vegetables section. I was craving for "kaki" or persimmon, the supermarket has sold out all of their stock. Grape session is over too, now what is out in the market is all kind of oranges and kiwi. 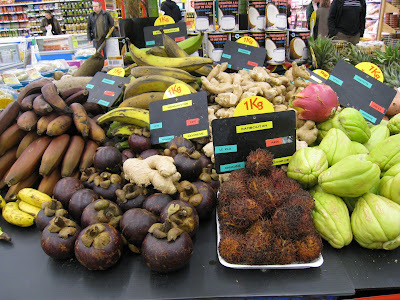 This supermarket has a corner for all the exotic fruits, and I saw rambutan and mangosteen. Gosh, 1kg of rambutan = 15euros = RM70. Can you imagine those black rambutan is so expensive? 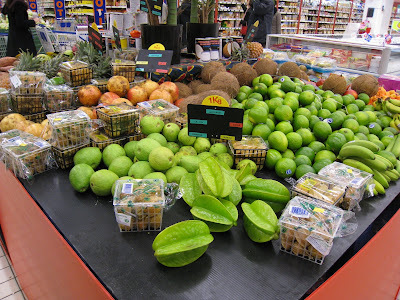 Out of all the exotic fruits here, only star fruit is from Malaysia. I wonder anyone buys them. I don't because it's too expensive. 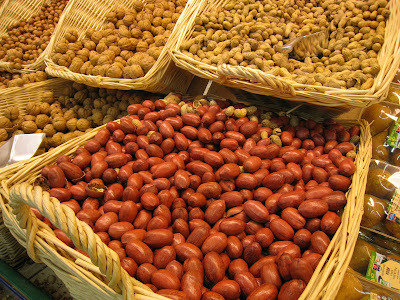 Saw this pecan nuts, I didn't know the shell is red color. Texas has a lot of Pecan but I had never seen them in the shell form. Now I can only imaging eating my favorite tropical fruits. How much are those mangoesteen? mangoesteen = 15.9 euros = RM78, even more expensive than rambutan. Pomelo is ok they have plenty now from China, not expensive at all. I'm not sure people actually buy those fruits, they probably just put their for the sake of variety. expensive ? i still love local fruits such as papaya and watermelon..